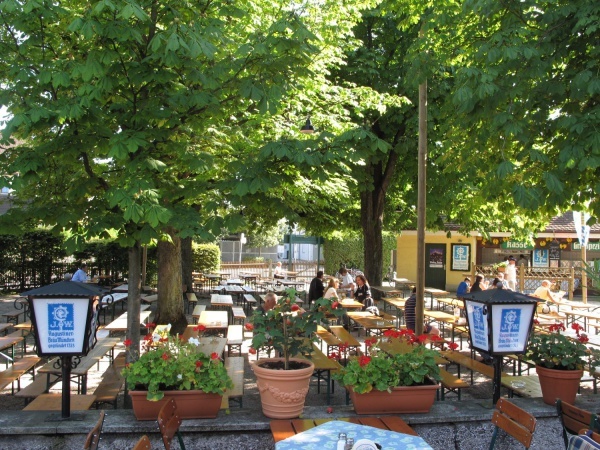 Since 1912, the Zum Grünen Baum beer garden is a second home to the residents of Obermenzing, a district in the western part of Munich. This otherwise quite unknown beer garden is an ideal location for an after-work beer amongst friends and colleagues. On weekends, families from around the neighbourhood enjoy a get-together in the beer garden. Zum Grünen Baum beer garden has about 800 seats on traditional beer garden benches in the self-serviced area, partly shaded by chestnut trees. The food stalls offer warm and cold Bavarian beer garden meals, such as Hendl (roasted chicken), Schweinshaxe (roasted pork knuckle) and Obatzda. The beer served is Augustiner and a Maß Hell (lager) costs € 7.00 (May 2018). During the week from May to September from 3pm to 5:30pm the "Feierabendmaß" costs only € 6.50 (May 2017). The sound of a bell announces the tapping of a new wooden barrel. "Overheated" guests can ask for an iced beer mug. Every second Tuesday in the month is the Musikantenstammtisch: musicians meet at their regular's table at 7pm for an evening of music-making and singing. Nearby attractions of the beer garden are the Blutenburg castle and the Nymphenburger Park and castle. The beer garden is open between April and October from 3pm. Throughout the winter months the restaurant is closed on Mondays.